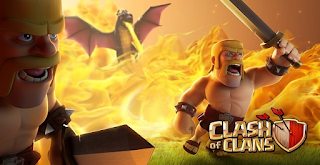 AnyIndo – Clash of clans is one of popular game on android and ios and most of the people in this word play this online game. I can’t deny that I love this game and this game makes you addicted if you are willing to install and play it, you will always open this game and play it all of day. There are many reasons which can make this online becomes popular and has many user in the worldwide, according to me it’s caused the developer is smart to get user’s attention and know how to make them love this online game. But the developer also understand how to make it has pros and cons, as you know clash of clans has weird logo on the ground according to some people. All characters in this online game is cool and has amazing graphic to play. I’ve noted the weakness of this game is we lose our gold when we are offline. This made me mad and many users complain this. You know, collect the gold is not that easy. We have to raid the other users while we lose many characters and to create them we need gold. It means we use gold to get more gold and the other users raid our gold when we are offline. If you are not busy, can open your clash of clans game all day, but no one has that chance because we have our activity in this real life. Because of this reason finally many users decided to find out the trick how to make clash of clans offline but no one can raid your troops. I notice this article as trick clash of clans android, because this works on android devices. For additional information, my brother's level in this game is full and up to 9th. I still have this game, though I don't open it again because I am so busy with my job in real life. But I admit it,this game is really cool to play.I was addicted of this online game. I opened it and always open although Finally I left because of my job. In this article we will guide you to make clash of clans always online on android to safe your gold. It means no troops can raid your gold when you don’t open your game. If many sites tell this by using many method, in this chance we are going to guide you how to make clash of clans always online with XMOD. Actually, XMOD is similar to Hiromacro but according to me this application is more practical and easy to use. To make you understand about use of this application, no method or trick to make your clash of clans can’t be raided permanently, except you you buy shield or you are always on 24 hours. By using this application your troops can’t be raided while the display on your screen is on, but if it is off it will automatically turn off. If your android device doesn’t have XMOD, download it firston Play Store. XMOD will work well if android device is rooted already, it means you have to root your device first if you want this application works well. If you’ve download XMOD and install it. Open XMOD and install MOD Clash Of Clans as the latest version of clash of clans. If clash of clans is updated already, make sure you update Mod clash of clans on XMOD also. Because if you do not update, it doesn’t work. When we enter into clash of clans game you will see ''X'' logo or little root for Xmod version on the right side. If you can't find that logo,just try to restart your device. If it appears, and then select ''Xmod'' and select ''Keep active'' to ON position. Done, and no one can raid or destroy your troops while your display is on. You can also set the duration of the display on settings to make it on longer. I used this when I still train my troops because training the troops take so more time while I can't always open my clash of clans game. I hope this article is useful for all android user who play clash of clans game. In another chance I will share my the other tricks about clash of clans game. You may sharing anything related this game just leave comment bellow. This game is still popular nowadays, and I think sharing about this game is good for our troops in the future. If you have any question related to this game and this article, you can leave comment bellow. Or you may tell your clan if you let me join your clan, we will work together there. Belum ada tanggapan untuk "How To Make Clash Of Clans Never Go Offline And Never Get Raided Anymore"